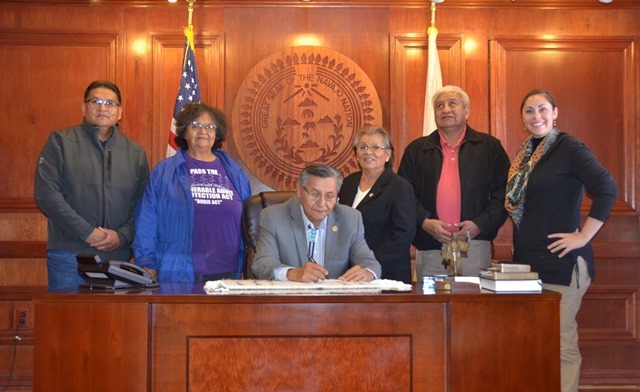 WINDOW ROCK (11-18-2014) – Navajo Nation President Ben Shelly signed an executive order on Monday that immediately ensures access to all community services across the Navajo Reservation for people with disabilities. Navajo Council Delegate Danny Simpson, who represents the communities of Becenti, Crownpoint, Huerfano, Lake Valley, Nageezi, Nahodishgish, Tse’ii’ahi, and Whiterock, joined Shelly for the signing ceremony on Monday. The executive order requires tribal government offices, chapter houses, enterprise buildings, and private businesses to make reasonable accommodations, including physical access to all facilities and services within the reservation for people with disabilities. Simpson collaborated with the Navajo Nation Advisory Council on Disabilities, the Native American Disability Law Center, and the Office of the President and Vice President in the generation of several initiatives and pieces of legislation, including the recent Navajo Adult Guardianship Act. The presidential executive order also mandates that tribal divisions, departments, and enterprises develop, update and, or amend current policies and procedures to insure that services are provided in an equitable and non-discriminatory manner so that disabled individuals have access to employment opportunities, housing, social services, recreation, and other services. Navajo Nation Advisory Council on Disabilities President Hoskie Benally, thanked the OPVP and Simpson for the executive order and added that the order stems from Council Resolution CN-61-84, which was passed in 1984 and affirmed that all Navajo people are entitled to participate fully in the economic, social, cultural, and political life of the Navajo Nation regardless of the person’s physical and mental capabilities. Benally said the Advisory Council on Disabilities is working with Simpson on several initiatives to help people with disabilities that includes working with public transit programs to ensure that wheelchair lifts are available on buses and other modes of transportation and ensuring that polling sites are accessible to disabled individuals during elections. In 2011, the Navajo Nation Advisory Council on Disabilities and the Native American Disability Law Center assessed a total of 15 public buildings across the reservation and determined that none of the buildings provided full access to disabled individuals. The findings of the NNACD and NADLC are reported in “Opening Doors: Accessibility of Public Buildings on the Navajo Nation“. The executive order is in effect immediately. This entry was posted in Professional Journal and tagged disabilities, disabled Navajo people, Native American Disability Law Center, Navajo Nation, Navajo Nation Advisory Council on Disabilities, Navajo Nation Council, President Ben Shelly by Marley Shebala. Bookmark the permalink.